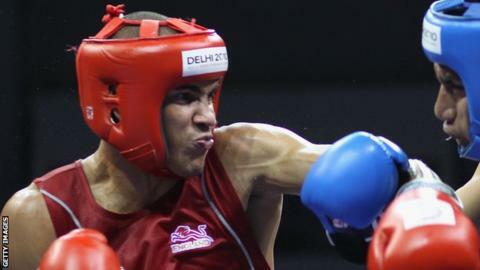 Olympic hopeful Anthony Ogogo has stepped back into the ring five months after undergoing shoulder surgery. Recovery from the procedure can take up to a year, but the middleweight is already sparring in preparation for April's European Qualifying event. "It's never nice being hit in the face," he told BBC Radio Suffolk. "When you've been out for five months taking that first punch is quite daunting. "But nothing recreates being in the ring with somebody and sparring." The 23-year-old from Lowestoft missed an opportunity to qualify for London 2012 when he failed to progress past the last 16 at the World Amateur Championships in October. He exasperated his shoulder injury during the tournament and has faced a race against time to prove his fitness - and be selected for Team GB - for the qualifying event in Turkey. "It's really sore. I'm doing everything really early and I'm pushing myself," explained the 2010 Commonwealth Games silver medallist. "The pain is out-weighed by the excitement and enthusiasm of getting back into the ring. "It would have been such a luxury if I had qualified at the World Championships last year and I could have had surgery and taken my time. "But I haven't got a choice. I'm really confident in my body now and hopefully that will come out in my performances."